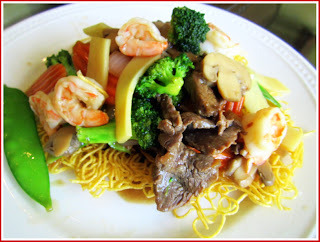 My husband's favorite dish to order in a Chinese restaurant is called Crispy Noodle.. You can usually choose from beef, chicken, shrimp, or combo. 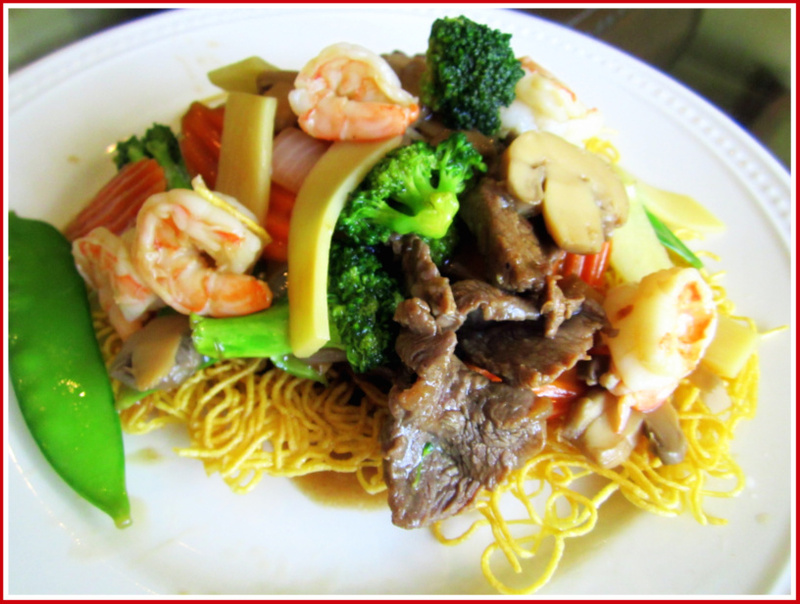 Then it arrives at your table with the usual assortment of Asian stir fry veggies, including bamboo shoots, snow peas, mushrooms, onion, and broccoli. And it's all covered in a light brown sauce. 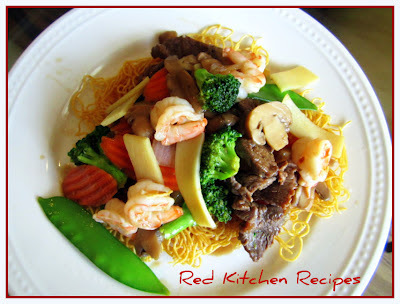 You can choose from just about any kind of noodle to prepare this dish. But I chose to use the wonton noodle that you can find in the refrigerated section of Sam's Oriental. I love this fresh noodle because it cooks in 45 seconds, it has .5 grams of saturated fat per 4oz. serving, and 17 grams of protein with 2 grams of fiber. Now compare that to a package of just about any brand of Ramen noodle. One block contains 7 grams of saturated fat, 1600 grams of sodium, and enough MSG that it's listed on the first line of the ingredients in the soup base. 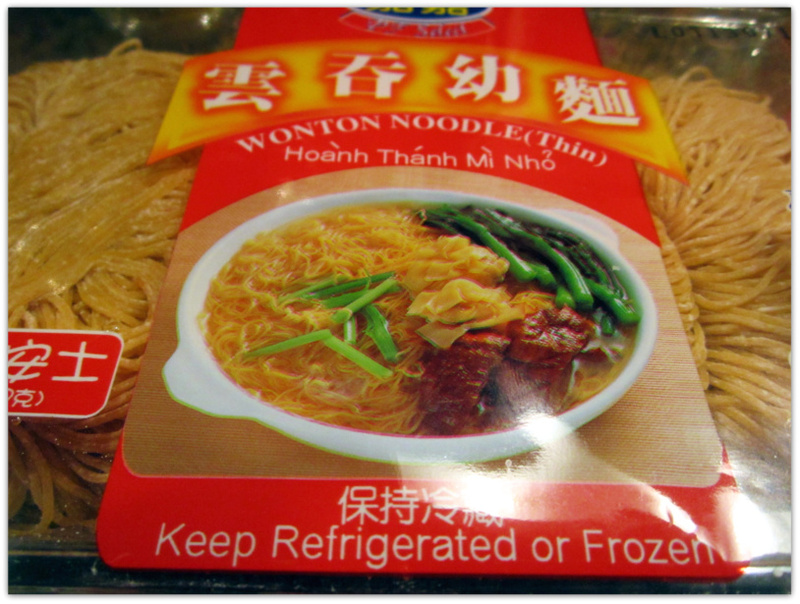 Another interesting factoid about these noodles: they are made with Potassium Carbonate and Sodium Carbonate. Also known as: Alkaline noodles, as made by David Chang of the Momofuku restaurant group, including Noodle Bar, famous for ramen noodles. If you've read his book, you know that he calls his ramen noodles Alkaline Noodles. So we're not too far off from ramen noodles, are we? I now, enough with my obsession with the Momofuku restuarant group! After all that talk about limited saturated fats in these noodles, I just go and fry them in peanut oil anyway. Not sure how much I added back in. If I used 2 tablespoons, does that mean I only added back in 4 grams of saturated fat? That might not be too bad! This crunchy noodle base topped with crisp - tender sauteed veggies and the light brown sauce is so worth the occasional splurge! 1. Slice the steak into strips by cutting across the grain. Marinate in the tamari, black pepper, sugar, and garlic powder. Place in the refrigerator about 2 hours. 2. Cook the noodles per package instructions, about 45 seconds, then drain. Add sesame oil if desired. 3. In a large saucepan, heat the peanut oil over medium high heat. 4. Add the onion and cook about 5 minutes. 5. Add the stir fry veggies. Toss to cook. 6. Prepare the packaged gravy by adding water and wisking, per package instructions. 7. Add the beef to the stir fry veggies. Remove some of the ingredients if needed to make room in the pan. Cook until the beef is medium. Add mushrooms and bamboo shoots. 8. Add the shrimp and continue to cook about 5 minutes until done. 9. In a separate pan, add about 2 tbsp peanut oil and heat about 5 minutes until hot. 10. Add a bundle of noodles, separating to make a thin layer around the pan. 11. Cook over medium heat for 5 minutes. Flip over and cook an additional 5 minutes until crisp. 12. 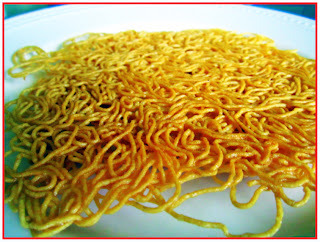 Plate the crispy noodles, top with the stir fry mixture, then add the gravy on top. Red kitchen recipes are always a hit and I always try all the recipes. 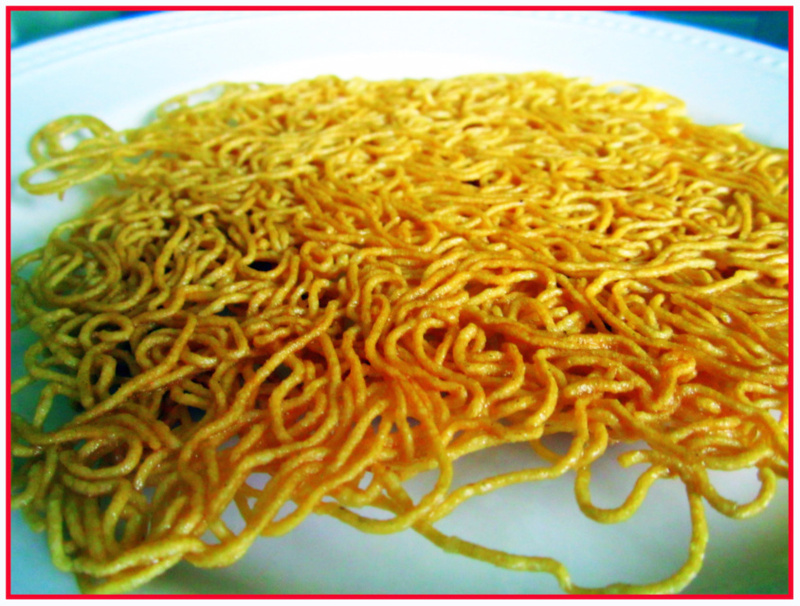 These crispy noodlles look so tempting and presentable. I can not wait to try these myself.